A couple of days ago my son sent me a text from college which went something like this “MOM, do you know realize you haven’t posted a new recipe on the blog for over a month?” I knew I had not been able to devote much time to the blog. 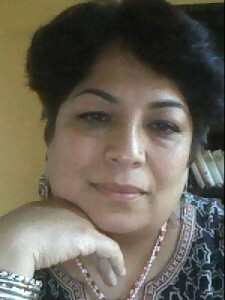 Until his text arrived, I had been justifying my neglect of the blog with all sorts of excuses (in my head) – that thanksgiving happened, too much work had kept me preoccupies, my asthma has been slowing me down, I had been hit by blogger block etc… Anyway, once I realized that my completely-laid back son had begun worrying about my blog and its recent dormancy, I had to get my act together. Over the past month, I have been cooking pretty much every single day. Due to health reasons (and my personal preferences) I have cut back on eating out quite a bit and so I have been cooking quite a lot. Thanksgiving week seemed to be one long blur of constant cooking, cleaning and re-utilizing left-overs. Despite all this, I just have not had the inclination to take pictures and write down the recipes – I guess I was going through a phase of procrastination. I had all these ideas for new recipes floating in my mind but I just didn’t get around to making them for the blog. One of the ideas I had, was for a wild rice recipe. I’d read somewhere that wild rice have a very high fiber content and that they have a low glycemic index and so I’d bought this bag of wild rice from Trader Joe’s a few weeks ago. 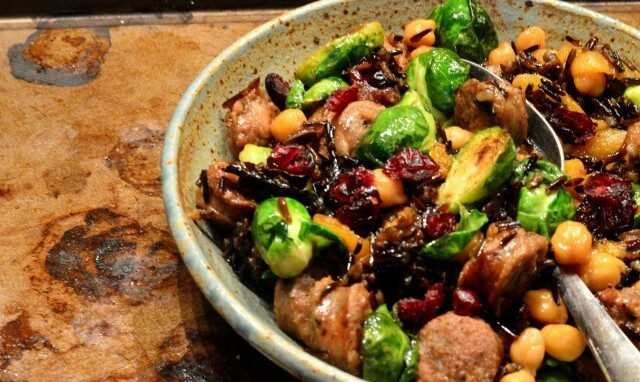 Finally today I made a wild rice pilaf with roasted Brussels sprouts and Pork Sausage (I used locally made organic Loukaniko sausage but you can use any kind of sausage). My regular readers know that if it’s just my husband and I at home (when the kids are at college or when we have no guests) I love to make one-pot-meals – it keeps our diet healthy and my life easy. Today’s wild rice recipe was yet another one of my successful one-pot endeavors. 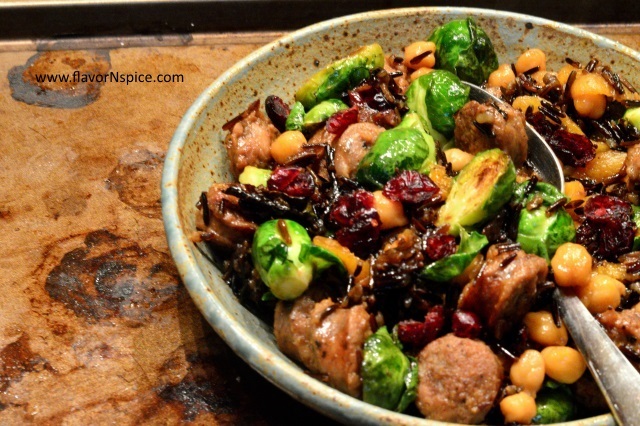 It has lots of flavor from the pork sausage, onions and garlic, lots of texture from the wild rice and chickpeas and lots of colors from the Brussels sprouts, dried Apricot and dried Cranberries. 2. In a heavy bottom pan, pour a little bit of olive oil and heat it. 3. Add the diced onions to the pot and stir. 4. 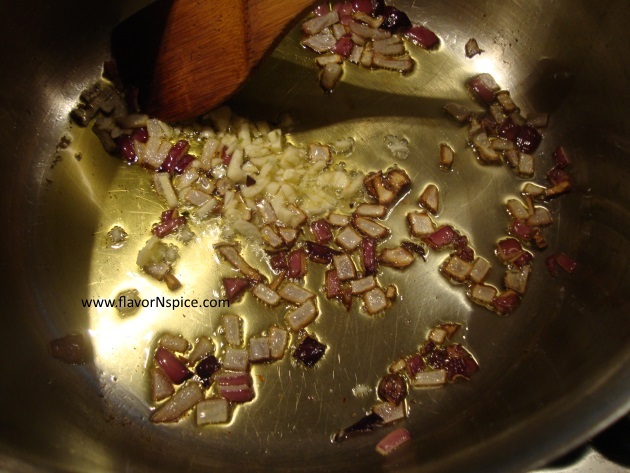 Peel and finely dice the garlic cloves and add to the pot. Stir. 5. After 30 second of adding the garlic, add the wild rice and stir everything. Cook the rice for 1-2 minutes (ensuring that all the rice gets coated with oil). 6. Add the broth and a bit of salt and pepper and stir. 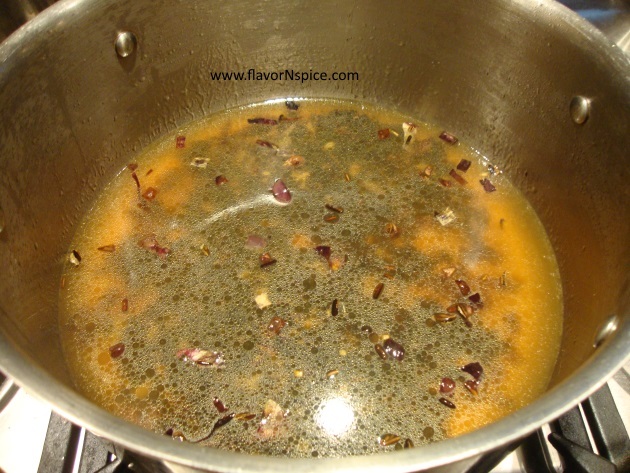 Cover the pot and let it simmer over low heat. 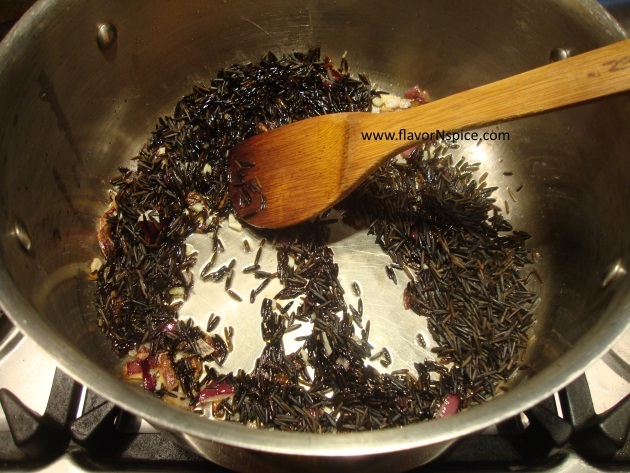 Wild rice takes about an hour to cook. 7. 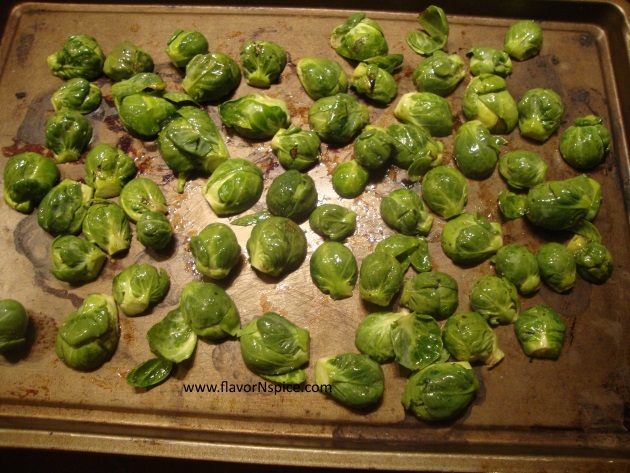 While the rice is cooking, slice the Brussels sprouts in halves, coat them with a little bit of olive oil and salt and place in a 325 F oven for 10-12 minutes (depending on the size of your Brussels sprouts). Roast them till they are lightly brown. 8. 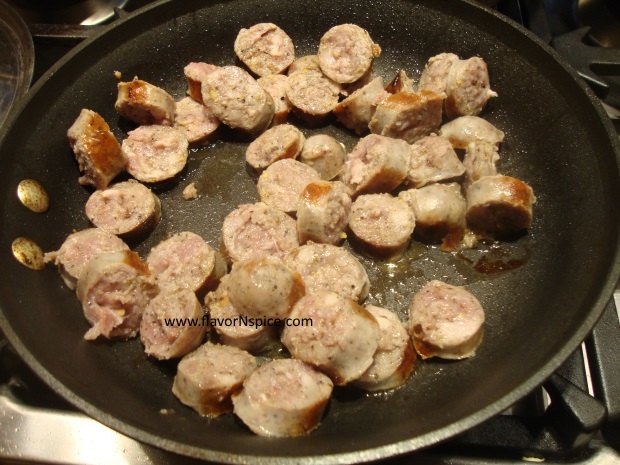 Cook the sausages in a small skillet with a little bit of olive at the bottom. 9. 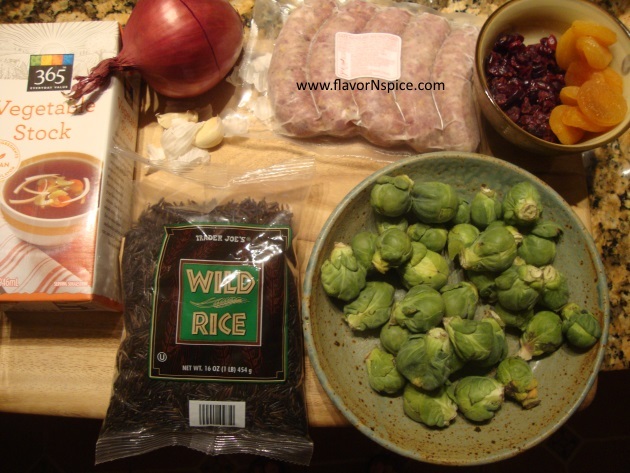 When the sausage pieces are browned, add them to the rice when the rice is ¾ of the way cooked. 10. 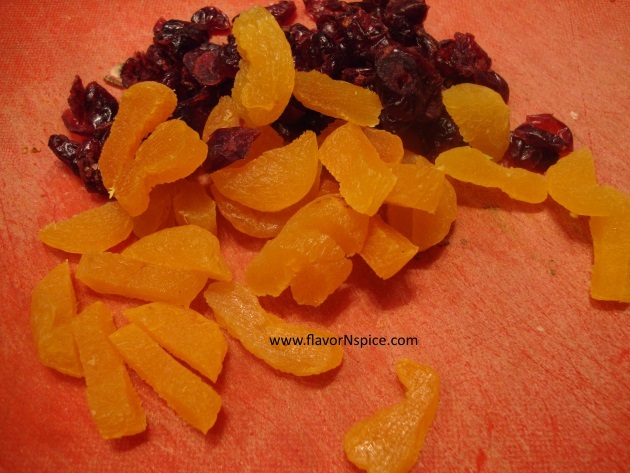 Thinly slice the dried apricots and add them and the dried cranberry to the rice and stir. 11. 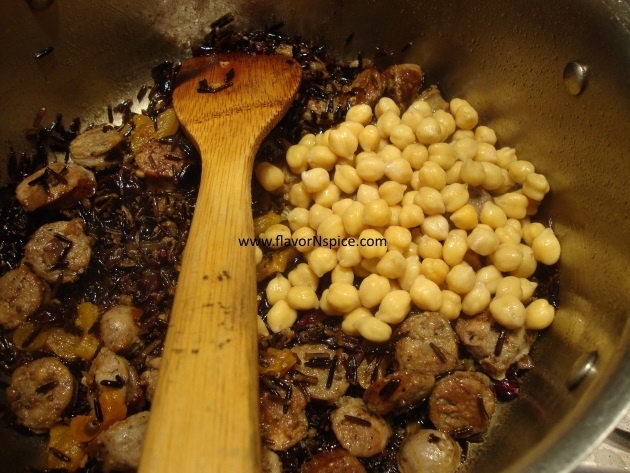 When the rice is almost completely done, add the boiled chickpeas to the pot and stir. This looks beautiful! Wow, I really love how colorful your dishes are. How would this be as a side dish, without the sausage? Would you have to add something else to give the rice flavoring? It says boiled chick peas but gives no instructions for boiling them. I’ve never boiled chick peas. Can you please explain? Jenn, you can always use canned chickpeas…otherwise, I buy dry ones, soak them overnight and in the morning boil them on low heat (till they are soft – usually takes an hour or so). Then drain the water out.